The argument is a brief synopsis of Dr. Fallon’s testimony to the House Subcommittee and Government Reform provided in April, 2016. Dr. Fallon’s testimony and defense of the VA’s status quo is similar to the testimony of Dr. David Cifu on PTSD therapy and Dr. Alvin Young (aka Dr. Orange) on the lethal side effects of Agent Orange used on the deforestation of Vietnam. The VA has set itself up as “judge and jury” to determine what range of medical services it will provide to Veterans. Any “new” therapy that has not been blessed by “evidence based medicine,” is summarily dismissed by the gatekeepers at the VA. In fact, the VA often uses spokespeople and expensive long-term clinical studies to avoid providing much needed therapy to Veterans. Furthermore, there is strong evidence to suggest that the DoD purposely manipulated testing procedures on hyperbaric oxygen therapy (“HBOT”) to produce clinical outcomes more to their liking. While the general public and Congressional leaders may buy the pitch from VA Spin Doctors, Veterans are seeking other forms of therapy outside of the VA. The problem is that few can afford to do so. Training a service dog is relatively expensive. Most estimates suggest that the cost of training a service dog to be in the neighborhood of $20,000. The training of a dog can last some five months after the dog reaches maturity (about six months) to another 18 months depending on the rigorousness of the training. 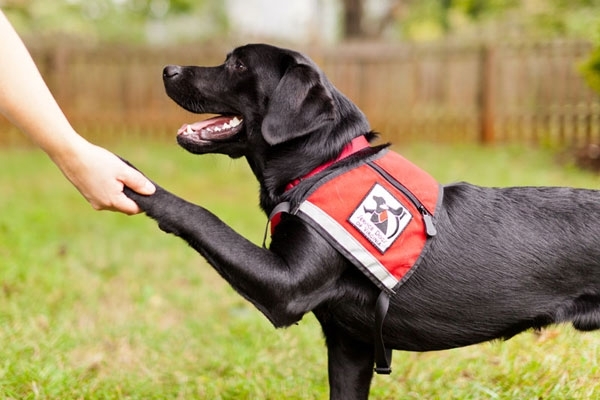 In addition to training the dog, the Veteran needs to spend a considerable amount of time with the service dog to develop an effective relationship. As we reported earlier, Maj. Ben Richards spent seven weeks in intensive training with his new service dog, Bronco. According to Ben, it was about 4 hours of training a day (generally in the morning) and a few weekend sessions. Taking into account “training the Veteran” could add considerably more to the overall cost. For those interesting in learning more about the steps involved in training a service dog, I refer you to this excellent FAQ provided by Psychiatric Service Dog Partners. While the VA currently does authorize the use of service dogs for Veterans, many State and charitable organizations have sprung to the support of Veterans. In addition to Ben’s heartwarming story, many other Veterans have benefited from the companionship of service dogs. Several organizations like 4PawsforAbility and Train a Dog and Save a Warrior,- SFTT Rescue Coalition Partner – are actively training and providing service dogs to Veterans. These organizations and several others rely on the generous contributions of others to support our Veterans. While the VA continues to study the benefits of service dogs, new results are not expected until 2019. One might justifiably ask why it takes the VA 9 years to study the benefits of service dogs for Veterans with PTSD (yes, Congress mandated a study in 2010), but Dr. Fallon and the VA spinmasters will provide you a compelling answer if you are naive enough to buy it. Based on the sound work of many charitable organizations training service dogs, it is beyond reasonable for the VA to soft-peddle its failed therapy programs and help these struggling organizations provide service dogs to Veterans. Wouldn’t it help provide “real” evidence to support their long overdue study?